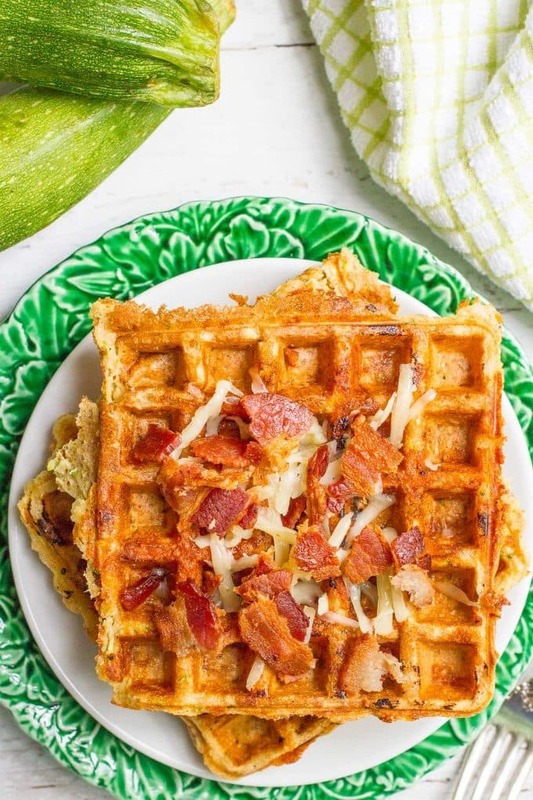 These savory waffles are completely whole wheat, stuffed with zucchini and super cheese-filled! Great for brunch or a breakfast-for-dinner night! Hello Friday! Friday is always welcome, but especially in the week after a holiday weekend. It’s been a short one with the Monday holiday, but sure hasn’t felt like it! Was it just me? 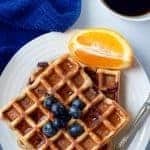 Moving on to the food… earlier this year, I shared how I came to finally own a waffle maker (as part of my whole wheat blueberry waffles with orange maple syrup recipe) and I promised you some savory waffles. Today, I am making good on that promise. 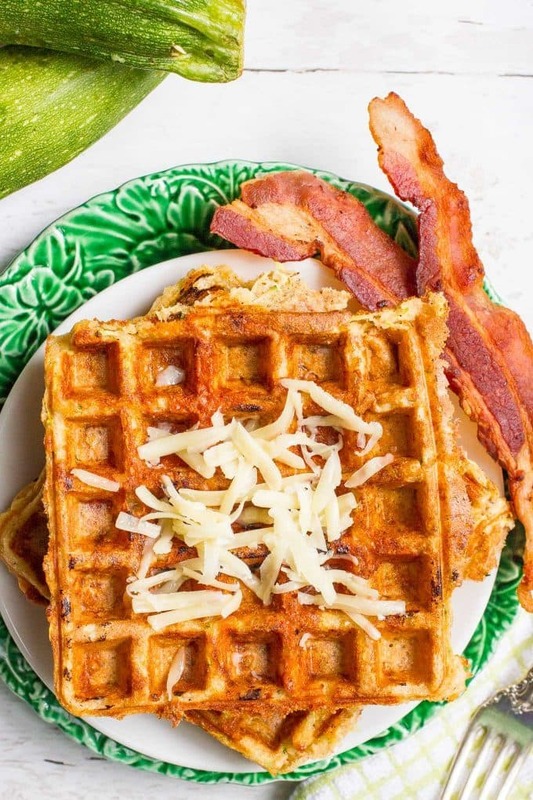 These whole wheat zucchini cheddar waffles were one of the first savory varieties I tried and they have been a serious hit! Originally, I thought this might be a yummy school lunch option to send with the kids to preschool. Not so much… they aren’t very good cold as it turns out. However, we have made them a favorite dinner and a delicious snack! I make them ahead (cause who has time to mess with waffle batter with hungry kids nipping at their heels) and then pop them in the toaster when it’s dinner time. This makes a big batch of waffles and I freeze the extras to have on hand. If you don’t pull them out in advance to defrost, just pop them in the microwave for a minute and then toast them to get it nice and crunchy and warm and gooey. And top with bacon if you so desire. Cause that’s always a good plan! I even took these with us on vacation to the beach earlier this summer to have something quick and easy on hand after a long day of playing in the sun. And now that school is about to start back up, I know I’ll want some healthy foods stashed away to make dinner a breeze. Speaking of, I’ve got a great post coming up for you next week on last-minute meal ideas for kids. For those nights when you realize it’s time to eat and you haven’t prepped a thing. Cause that’s me, many nights, for the kids’ dinner. And they’ve never eaten take-out or fast food so I have developed all kinds of tricks and tips for pulling healthy meals together! 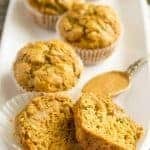 So sign up for my free weekly e-newsletter and never miss a recipe. (You’ll also get my free e-cookbook, Easy Weeknight Dinners, when you sign up.) 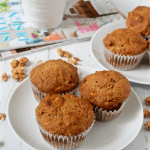 I’d also love to connect on social media – follow me on Facebook, Instagram, Pinterest and Twitter for more recipe goodness! 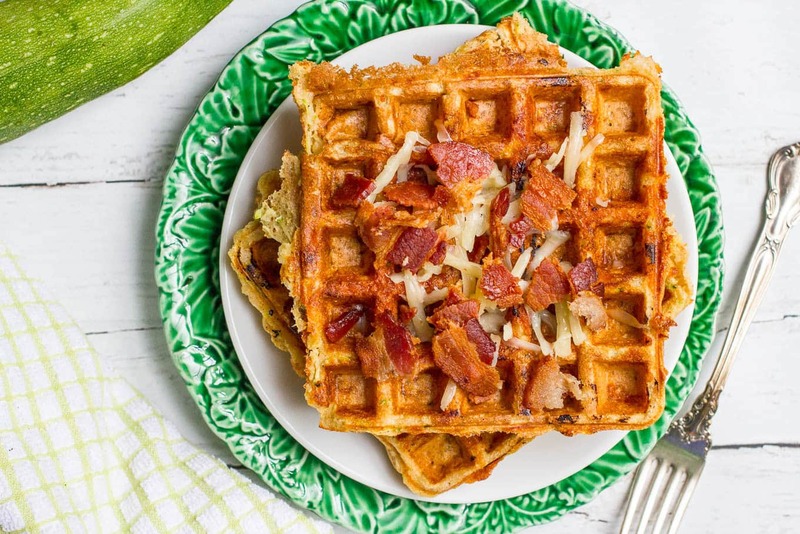 But in the meantime, enjoy your weekend and enjoy these savory waffles! 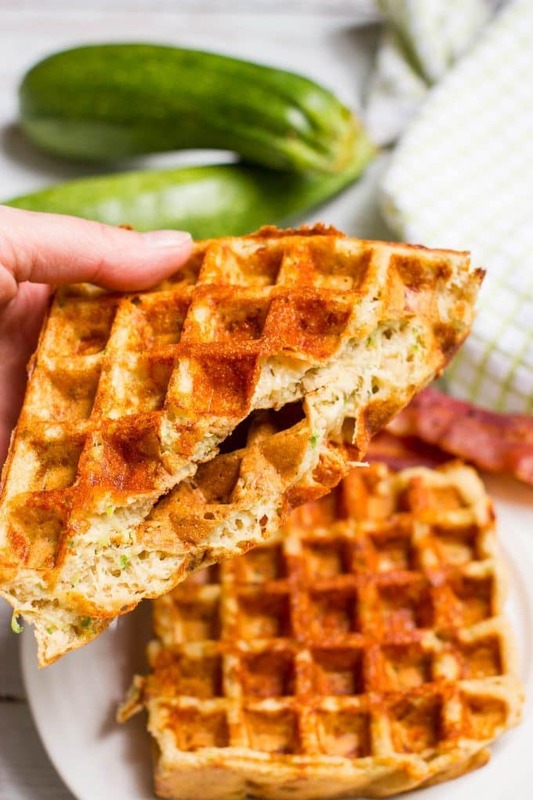 Savory whole wheat waffles stuffed with zucchini and cheddar cheese! Grate the zucchini and shred the cheddar cheese. Make a well in the center of the dry ingredients and add the egg, milk and Greek yogurt. Stir the wet ingredients together in the middle and then mix them into the dry ingredients until combined. You may have a few lumps, which is fine. Be careful not to over mix. 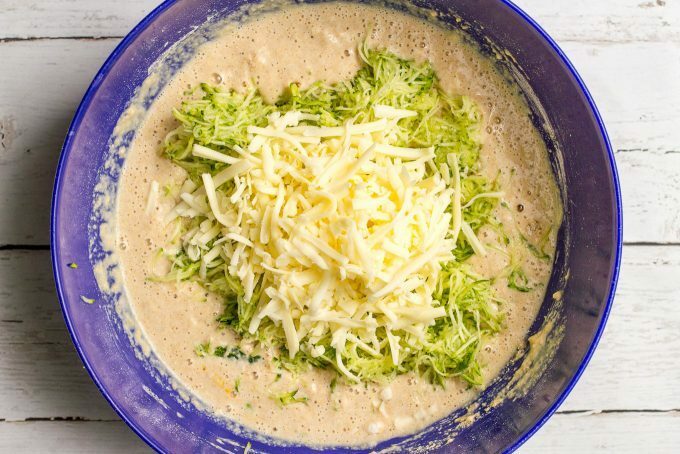 Fold in the grated zucchini and 3/4 cup of the shredded cheddar cheese until combined, but again, don’t overmix. The batter will be very thick. 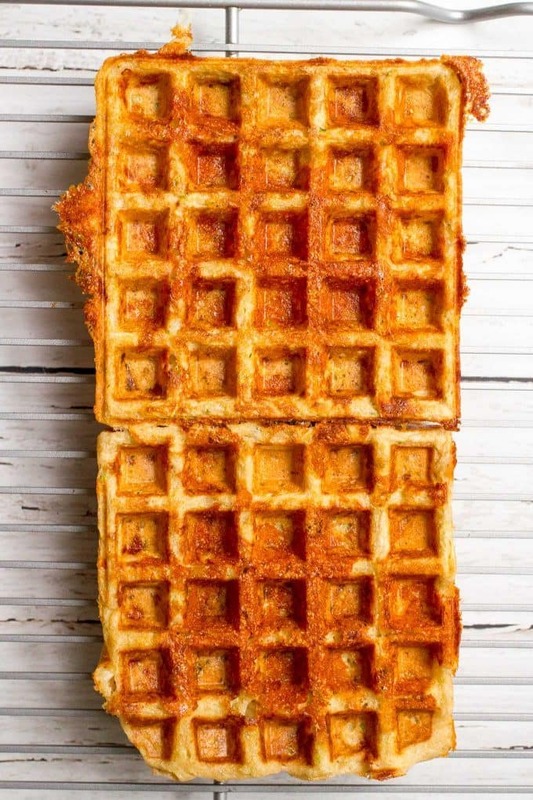 Pour the batter into your waffle iron and sprinkle each waffle with 2 tablespoons of cheddar cheese before closing lid. P.S. This is the Breville waffle maker I own. Highly recommend. If it’s a bit too steep in price for you, this one is similar and gets good reviews and is more economical. And this one is the #1 best seller and also more affordable. Disclaimer: Those are affiliate links. If you purchase a product through an affiliate link, your cost will be the same but I receive a small commission. Your support is greatly appreciated! Oh my goodness, M sounds so adorable! I love that she is all about the food…me too 😀 !! These waffles look great, Kathryn. Love how you can make them ahead and reheat later and I especially love the serving suggestion of topping with bacon. Chicken n waffles is one of my favourite weekend meals. I’d love to try this version of waffles next time we do that! Hope you have a lovely weekend! Thanks Dawn!! She definitely gets it from me 😉 And yes, didn’t think about that connection… chicken and waffles is definitely a Southern classic – this would be a much more low-key and healthier twist 🙂 Have a great weekend! Glad you’re in the savory waffle fan club! And yes, this would be fabulous with a poached or fried egg on top!! This is such a fabulous idea! I just love how golden they are with a bit of savory (and salty, thankyouverymuchbacon)! Mmm! Haha, thank you bacon indeed! 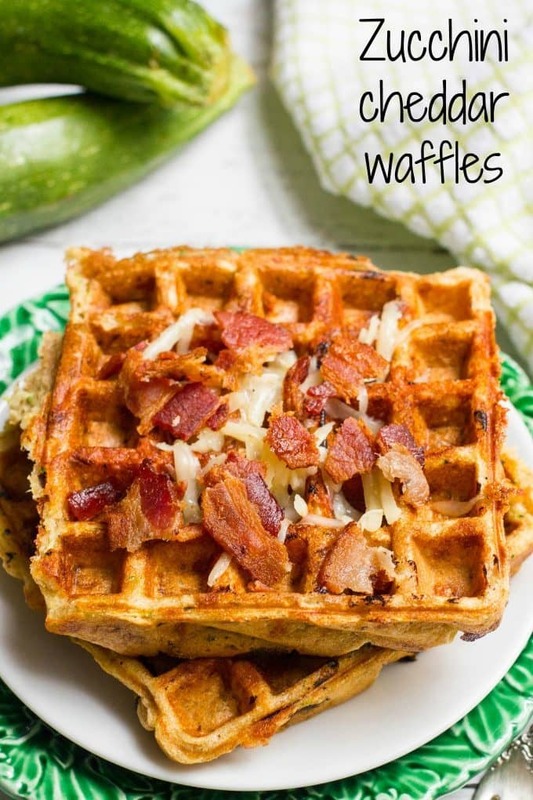 These are definitely a fun twist on a regular waffle. Thanks Patricia! I love waffles and definitely need to try making savory ones! 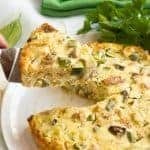 These look amazing and I love how they can be made ahead for an easy dinner! P.S I don't have any problems with my child's dinner… only requires I open a can of food and mix it with a bit of dry kibble from a bag. lol. But I have a feeling you always kill it during dinner time. I mean, I DO follow your blog and I've SEEN all your amazing eats!! 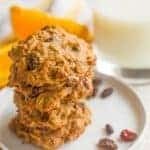 These look delicious – love the flavor combo! I don’t have a waffle maker, but do you think the batter would work well as muffins or a loaf of bread? Good to know! I was thinking of it as a loaf more than a bread. If you do it and it works, i’d love to know! And I’ll have to convince my husband we should get a waffle iron. Too many gadgets in the kitchen! I wanted to make a chicken soup today, but now I am reconsidering! 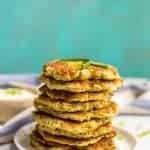 These zucchini waffles sound and look amazing and I bet both my kids would eat ALL their dinner as well, if I make these. I’ll absolutely make you a batch Karrie 🙂 We’ve always got tons of zucchini on hand in the summer! Oh my those look delicious! I don’t think I’ve ever had a savory waffle! I know, shocking. These look fantastic! Thanks for the great idea. You’ll love them Chellie! A fun change of pace! That is an AWESOME recipe. Brunch is my favorite meal of the day!